Synopsis: With the levee about to break, Hushpuppy is confronted with the immediate reality of her situation - how best to help her alcoholic dad deal with the looming disaster that will reek havoc on their already fragile existence on the edges of the marshland they call home. This entrancing movie has one big selling point. The astounding performance of newcomer Quvenzhané Wallis (pronounced "kwa van je nay") is a revelation that brings a tear to even the most jaded of eyes. For a young girl (5 when she auditioned, 6 when it was made, 8 at time of writing), her seemingly effortless ability to display maturity & wisdom well beyond her young age is, quite frankly, outstanding. As I've mentioned many a time in other reviews (It is fundamentally pertinent in respect to this film), if you get the casting right - the film has a substantial foundation to build upon. 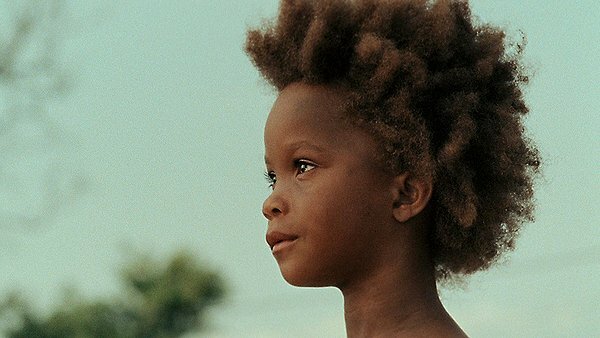 I've read that director Benh Zeitlin searched long and very hard for the right actress to play the role of Hushpuppy. He auditioned up to about 4000! different young people who he thought could do justice to the character. Young Ms Wallis initially came along with elder sister as a lark, not intending to audition. The rest, as they say, is history. But, what set her apart from all the other young hopeful's? What 'X-factor' did she bring to her audition that made her click with the producers? Unless we ever get to see 3999 other screen tests (We wont. Thankfully! Who'd want that task? ), we'll never know. What we do know is that this is a young lady with potential for future greatness in the industry - should she choose it. Beasts' story is centered upon Hushpuppy's gradual realization that she needs to rely on instincts - and retreat into the chambers of her fertile imagination to deal with the increasing awareness that all the adults around her are falling to pieces - specifically her alcoholic father (Another 'first-timer like Ms Wallis. Another natural as well!). Couple this backdrop with his inability to face his rapidly changing situation which is the fast approaching encroachment of his personal sanctuary by mother nature (Via the storms heading for the small barely held together ramshackle community of tortured souls who steadfastly refuse to heed the warnings of the dangers headed their way). Add some rampaging Aurochs rampaging their way due to global warming - melting icecaps sending them via Louisiana - and well, you have a tale like nothing else you've seen before. Although the fantasy-like elements of the story may put some of you off, it only adds to the inherent charm of this fable. The only caveat to this film (For some people - understandably) is the use of a hand-held camera - for the duration of the running time. For me, it added to the story- rather than detracting from it. In fact, much of the charm would be lost if a conventional set-up was used.